We all know that we need to do the dishes every day but what about everything else in the house. This infographic from HappyCleans looks at items you may have not cleaned in a while but hopefully will do when you’re finished reading. For example, we make our bed every day but how often do you wash your sheets? You really should try to get to these at least once a week. Now onto the actual mattress and you should wash this every couple of months so your bed is really clean for a good night’s sleep. Another area that can get pretty dirty is the refrigerator and amazingly research has shown that salad drawers can have 750 times the safe level of bacteria so you should really try to clean out the fridge at least every month. The dishwasher is another place that can suffer from a build-up of food debris and grease so it is another area you should attend to on a monthly basis. 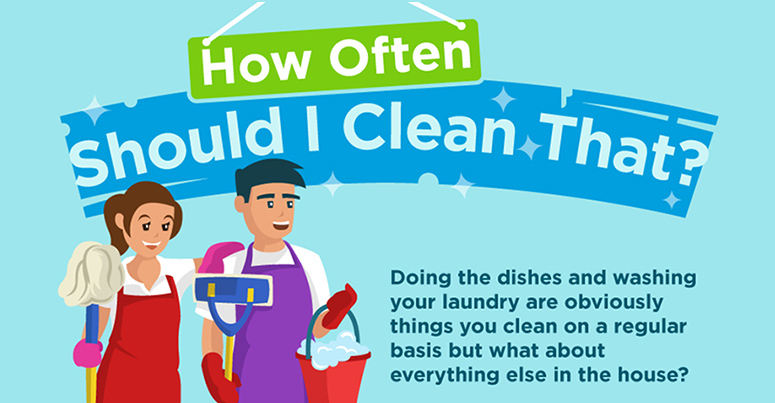 See the full infographic now for more information and get to cleaning those forgotten about areas today!